The first-ever self-climbing Ipomoea! 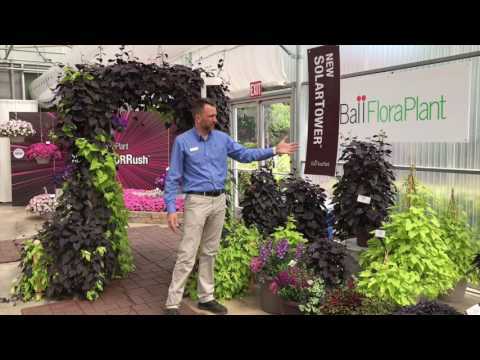 SolarTower climbs very quickly and fills a large pot on a quick turn. Climbing plant is ideal for use with a trellis, as a topiary or on a vertical wall planting. Recommended pot size is 1 gallon and up, with some kind of trellis, making a huge impact at retail. Also recommended as a thriller in mixed combos, climbing up a small bamboo stick. Easy for the grower to maintain and produce, as it should not need any trimming, PGRs or training to climb the trellis. Provides instant garden décor for consumers. NEW Lime Improved: Features higher vigor to better match Black. Comments: Avoid cold and wet conditions. In order for the product to climb pots, it needs to have a stake or trellis included.